It’s a shame A Dog's Purpose had such an unfortunate incident occur before it opened, as the heart and sentiment behind the movie is pro pet, and I think a lot of pet lovers would have enjoyed it. Everyone knows that even before A Dog's Purpose opened in theaters this past January it was embroiled in a scandal. A video surfaced of what looked like a trainer forcing a terrified dog into a pool of rushing water and animal cruelty allegations were tossed around. What started out as PR for a movie full of cute dogs ended up becoming damage control amongst calls for boycotts from animal activists. Unfortunately, these events overshadowed a film that animal lovers probably would have enjoyed. It had some sweet moments and perpetuated an idea I think most pet owners would have liked - pet reincarnation. Bailey (voiced by Josh Gad; Frozen) was born a retriever and wandered the streets until he was picked up by some maintenance workers who thought to sell him. Left in a hot car, he was rescued and brought home by Ethan (Bryce Gheiser, Walk the Plank; KJ Apa, Riverdale; Dennis Quaid, Footloose) and his mom. There, he was loved and cared for during the next 10 years until his passing. Next, he returned as Ella, a female police dog German Shepard who gets shot in the line of duty. Third, he is an adorable corgi who probably lives the happiest of all his lives and, finally, he comes back as a mutt who manages to find his way back to an older Ethan and reunited Ethan with his high school sweetheart Hannah (Peggy Lipton, The Postman; Britt Robertson, Tomorrowland). In the film, Bailey's purpose – A Dog's Purpose –is to make people happy and he tries his best, though he doesn't always succeed. As we hear his thoughts, numerous times he thinks he is doing what makes his owner happy but, in reality, he isn't. Interestingly, he isn't always making himself happy either, such as when he is a police dog. He mentions at that time that he doesn't play like he did with Ethan but that he did "good work" as Ella. There is a saying in Hollywood not to work with children or animals and, in this film, I could see that would be the case. Every actor was overshadowed by these adorable creatures (the corgi was my favorite). Having said that, all of the actors from Gheisar, who played 8-year-old Ethan, to seasoned veteran Dennis Quaid did a good job. Gad's voice talent was also certainly a highlight, as he helped us see the world through Bailey's eyes. Unfortunately, I can't say the same for the script. As I was watching the movie I kept thinking, "It's a Nicholas Sparks movie for dogs". The melodramatic nature of the pets, the romances, the heartbreaks, etc. were all over the top and made me want to roll my eyes on more than one occasion. In a nutshell… great idea, mediocre execution. The Blu-ray quality is strong with 1080p high definition video and DTS-HD 5.1 audio. The colors are clear with variations that stand out on the dogs' fur and the special effects are not easily discernable with the naked eye. The audio is sharp and the dialogue and dog barks are layered throughout. The Combo pack extras include: Deleted scenes, outtakes (mostly of the dogs) Lights, Camera, Woofs!, and A Writer's Purpose. It's a shame the movie had such an unfortunate incident occur before it opened, as the heart and sentiment behind the movie is pro pet, and I think a lot of pet lovers would have enjoyed it. It is lighthearted and adorable and if you can survive watching a dog pass away three times (but even that was handled well) then I think you might like this one and get some deeper meaning from the film. Download A Dog's Purpose from the iTunes Store in Digial HD. 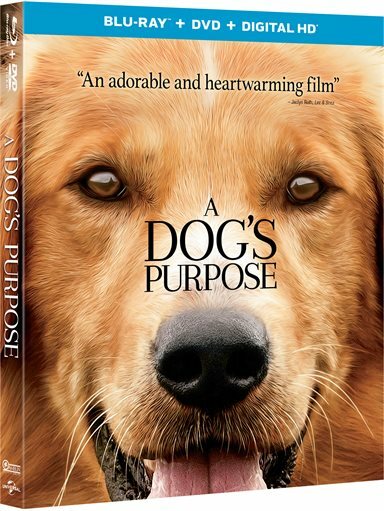 For more information about A Dog's Purpose visit the FlickDirect Movie Database.